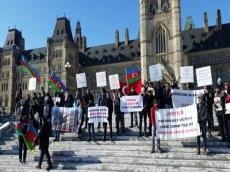 Azerbaijanis living in Canada have staged a protest rally outside the Canadian parliament building in Ottawa to mark the 23rd anniversary of the Khojaly Genocide. The rally organized by Azerbaijani students who receive education at the universities of Waterloo and Toronto, also involved Turkish students, AzerTag state news agency reported. The protesters, who held Azerbaijani and Turkish flags, urged international recognition for the Khojaly Genocide. They distributed brochures and magazines about the Khojaly Genocide among local residents and guests of the Canadian capital.